Micro PIV-LIF System | SEIKA Digital Image Corporation. 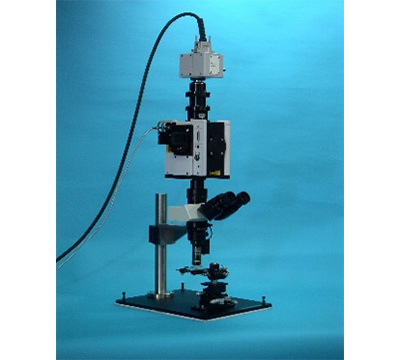 The Micro PIV-LIF System is designed to analyze the velocity distribution, mixing and diffusion of a microfludic system. The Micro PIV-LIF System is widely used for the development of microbio / microchemical chips called micro-TAS or labs-on-a-chip. Various new micro PIV analyzing technologies have been adopted for the system, including average correlation and SAT-PTV. The broad lineup of the Micro PIV System supports research and development of microfluidics technology. In addition to conventional double pulse type micro PIV (2D, Stereo 3D) and Time Resolved PIV, we provide a broad lineup of micro PIV such as confocal scanning micro PIV. As specialized micro-optical systems, models for high-output pulse lasers or UV lasers are also included in the series. We provide many options of peripheral devices. For example, the focus scanner can synchronise the focal plane with the frame of a high-speed video camera to permit high-speed scanning. We also have various options for the fluorescent tracer particles necessary for micro PIV and users can choose the one most suitable for their measurements based on color, size and the characteristic of their fluid. The micro PIV can measure concentration distribution, temperature distribution, diffusion, mixing, reaction, pH and other characteristics. Coaxial episcopic illumination with a high-output pulse laser, which is beyond the power of general microscopes, can be used with the specialized micro-optical system. In micro PIV, the important concept is not Depth of Field (DOF), but Measurement Depth (MD). To define the resolution in the depth direction (the ""z resolution""). 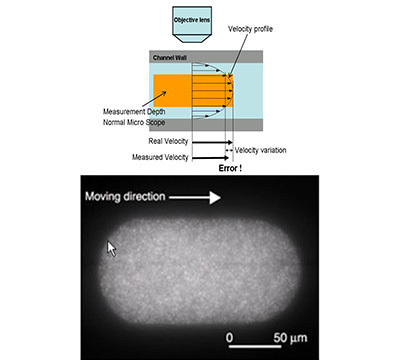 MD, which was proposed by Professor D. Meinhart (University of California, Santa Barbara) and other researchers, defines the range in which the light intensity of particle images is strong enough to affect the velocity measurement. Generally, MD is considerably larger than DOF. In normal Micro PIV, MD is considerably thicker than the supposed DOF of the object lens, therefore, multiple velocity components included in the thickness of the MD cause errors (Fig). 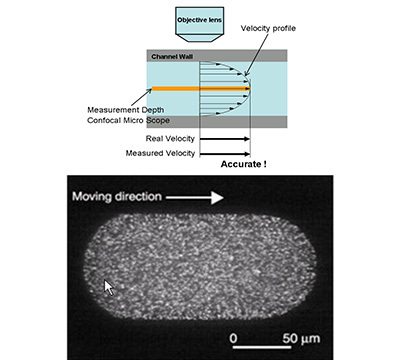 By contrast, in a confocal scanning micro PIV, MD can be thin enough to include only one velocity component, and therefore highly precise measurement distribution in microfluidics is possible. Ordinarily, fluorescent particles are not used in a Micro PIV, instead a liquid that has a fluorescent agent dissolved in it is used. Consequently, the liquid becomes fluorescent in of itself. 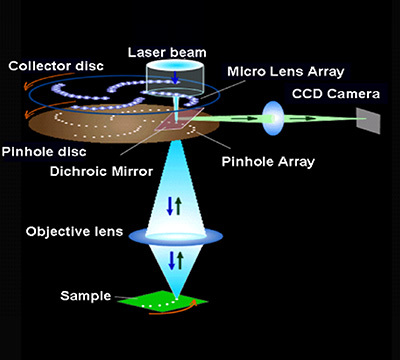 If the liquid is observed using a normal microscope, even though a high NA lens may be used, unintended stray light caused by the fluorescence in front and behind the focal plane makes spatial resolution along the optical axial (Z) deteriorate. (Compared to the X and Y directions, deterioration of the resolution in the Z direction is more remarkable.) Confocal imaging technology cuts almost all of the fluorescence in front and behind the focal plane, therefore, the resolution in the Z direction become as high as that of X and Y directions. There are double pulse type for micro PIV camera and ultra high sensitivity high speed type for confocal imaging.